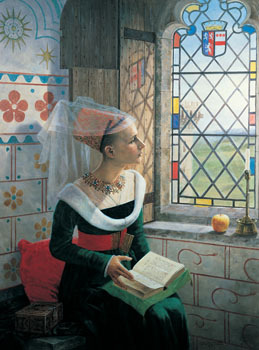 Sitting at the window of a great castle, a fashionably dressed Lady looks up from her book, her mind clearly lost in distant thoughts. Reproduced in full colour from an original painting by Graham Turner. Cards are blank inside, allowing you to add your own greeting or making them suitable for use as notelets. Approximate card size - 18.5cm x 15cm. Available either individually or in a pack of five cards of the same design - please select below. 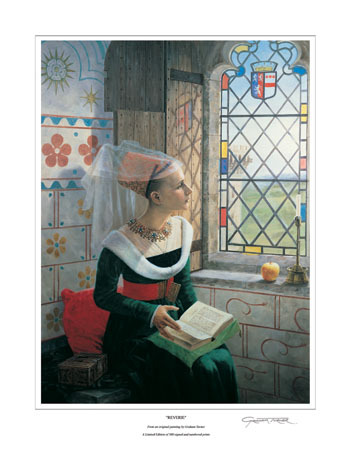 This greeting card is also available as part of an assorted set of five different cards, all reproduced from Graham Turner's medieval paintings.